Video caption: What's another name for a hummingbird's beak?What's another name for a hummingbird's beak? That's all from Holyrood Live on 14 June 2018. Do you know another name for a hummingbird's beak? That question from Richard Leonard flummoxed Nicola Sturgeon during first minister's questions. After she replied that she did not "immediately" know the answer, Mr Leonard told her the question had been asked during the standardised literacy testing of five-year-olds. Mr Leonard insisted confident children were being "crushed" by these tests, with children "driven to tears". The first minister replied that when she had been chatting with five-year-olds the previous day, none were in tears or crushed. The answer was a "bill" and it later emerged children had to pick this out of a multiple choice which also included "skin" and "body". Labour MSP Neil Findlay raises a point of order about today's guest to Holyrood for FMQs, Andriy Parubiy of the Ukranian parliament, who he says once controlled the paramilitary wing of a fascist party. Presiding Officer Ken MacIntosh says it is his role to welcome a variety of people to the Scottish parliament in his behalf. That is exactly the point, responds Mr Findlay. Members do not know who they are being asked to welcome to this parliament, he says. "I would prefer to know the next time I am invited to welcome a racist, fascist Nazi to this parliament." The presiding officer says it is expected that any speaker from elsewhere is welcomed to the parliament. Standards Committee deputy convener Patrick Harvie thanks all those who helped with this inquriy. Mr Harvie insists the procedures for how to deal with sexual harassment must be got right, but the barriers to reporting must also be tackled. The Scottish Green Party co-convener highlights the cluttered landscape of employers and potential relationships at Holyrood and warns against any fragmentation in dealing with complaints. He backs the call for a central policy to deal with sexual harassment complaints at Hoyrood, across all the employers. Mr Harvie says there is a particular problem with men and so-called "locker room banter" and adds if we don't call out behaviour then there is a failure in responsibility. The Green MSP accepts the issue of recall of an MSP needs to be thought about, but adds there is already a threshold for dismissal of an MSP that currently lies with the courts. MSPs must not be seen to have a higher level of protection and concludes arguing the stauts quo needs to be challenged. Tory MSP Michelle Ballantyne says in order to tackle sexual harassment, we must first be able to recognise it. She hopes the publication of the zero-tolerance statement from the joint working group is the beginning of real action. Training will play an important role and a lack of it cannot be proffered as a defence, she states. We still have a number of options we need to explore in detail, Ms Ballantyne asserts. "We have the responsibility to lead by example," she concludes. Labour MSP James Kelly says: "The statistics in the sexual harassment survey were absolutely shocking and worrying." Mr Kelly insists they were completely unacceptable. The Labour MSP says the Parliament needs to take a close look at itself as there is a lack of confidence about bringing complaints forward. He calls for a central policy sitting above political parties, adding an independent investigator would help. "The status quo is not good enough, there is a lot of work to do by the working group, I'm glad Engender are involved in that." In January we reported nine calls had been made to the Scottish Parliament's sexual harassment helpline since it was established in November last year. The parliament set up the phone line as part of a range of actions after claims of a "catalogue of abuse" in politics. Ministers have resigned from both the UK and Scottish governments amid allegations of inappropriate behaviour. Holyrood's standards committee opened its inquiry into how parliament deals with claims of harassment. Concerns were first voiced in October 2017 after lawyer Aamer Anwar claimed that "a number of women" had complained of harassment ranging from online stalking to physical assault. Scottish Lib Dem leader Willie Rennie says there was a degree of complacency in the early days of the sexual harassment revelations, with the suggestion being Holyrood was above it. The results of the staff survey paid heed to that, he states. Mr Rennie asserts that any process for sanctions must be robust enough to avoid people playing party politics. We need to consider options outside our comfort zone in order to send a message out the MSPs, he says. An independent process with some kind of recall system made be necessary, the Lib Dem MSP asserts. A former Scottish government minister returned to Holyrood in March for the first time in four months despite mounting pressure for him to quit over harassment claims. Mark McDonald is sitting as the independent MSP for Aberdeen Donside after resigning from the SNP. 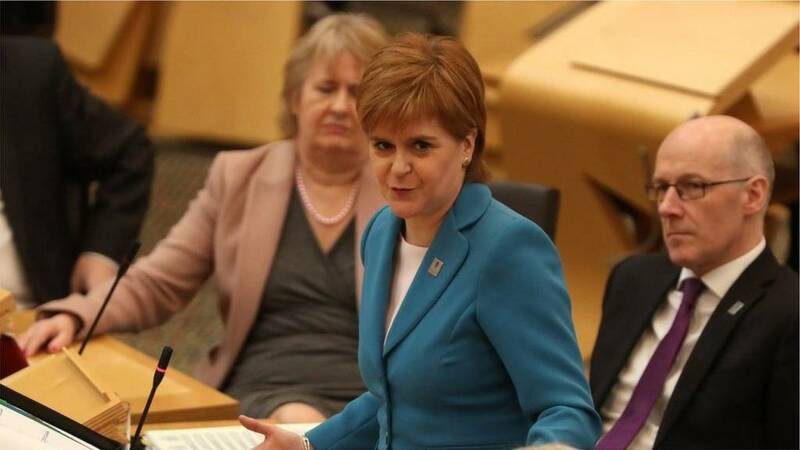 First Minister Nicola Sturgeon and many of his other former colleagues have called on him to stand down as an MSP. But Mr McDonald urged voters to give him a "second chance". Scotland's public ethics watchdog said it was to investigate the conduct Mr McDonald. Labour MSP Rhoda Grant says: "Initially I was disappointed with the report as I expected to see some leadership from it." It feels like an interim report rather than a final report, she says. Ms Grant insists: "We need to recognise this is not a normal workplace." Good politicians do not necessarily make good managers, she says. The Labour MSP says: "We need to look at how an MSP can be brought to book for unacceptable behaviour." It is untenable there is not a system that can hold MSPs to account, including the possibility of deselection, Ms Grant states. She calls for a system thas supports Holyrood's staff. In October Scotland's health secretary said she was very concerned by claims of sexual harassment at the Scottish Parliament. Shona Robison was responding to reports that women at all levels in Holyrood have experienced harassment. Human rights lawyer Aamer Anwar told the Sunday Herald newspaper that a "number of women" had approached him about the issue. Ms Robison called on those affected to contact parliamentary authorities. Speaking on the BBC's Sunday Politics Scotland programme, Shona Robison said it was time the issue was addressed. Tory MSP Jamie Halcro Johnson highlights the findings of the parliament's sexual harassment survey which found 30% of female staffers had been on the receiving end of harassment. In virtually all sectors, the majority of inappropriate conduct in the workplace goes unreported he says. How we ensure complaints are reported and heard is therefore key, says Mr Johnson. No one should be deterred from making a complaint because the structures make it challenging, he insists. The Tory MSP says it is for the parliament now to consider a possible sanction process. In March we reported one fifth of Scottish Parliament staff - including one in three women - hadexperienced sexual harassment or sexist behaviour while working at Holyrood. The parliament published the results of a confidential survey of MSPs and staff which more than 1,000 took part in. A fifth of respondents said they had experienced such behaviour, including 30% of women. Presiding Officer Ken Macintosh said the survey results "make difficult reading". Parliamentary Business Minister Joe Fitzpatrick says the government fully supports the committee's inquiry. Sexual harassment and abuse of any kind are completely reprehensible and cannot be tolerated, he says. The minister insists it would be unacceptable for anyone to feel inhibited about working at Holyrood or for the Scottish government . He says the government is conducting a wider review of its fairness at work polices, including revising the government's standards in the workplace. Ms Haughey welcomes statement from the joint working group on a zero-tolerance policy earlier this week. We also need to ensure safeguards for those reporting sexual harassment are in place, she adds. It is virtually impossible for a complaint to be made on a confidential basis due to the small nature of MSPs' teams, the convener explains. On mandatory training, Ms Haughey explains this will help both to highlight behaviour to potential abusers and also to ensure managers are aware of what they can do to respond to the issue. The process of recall or dismissal to mirror gross misconduct in a normal workplace is worthy of further consideration, she says. However, she notes this suspension from elected office could result in more serious impacts than normal employment. Holyrood's Standards Committee agreed to launch an inquiry into how the parliament deals with reports of sexual harassment. In light of recent concerns about harassment and inappropriate behaviour, the committee examined procedures, rules and support for victims. MSPs took evidence from equalities groups, legal experts and unions and look at how other parliaments operate. Convener Clare Adamson said it was an "important and detailed bit of work". Meanwhile, two members of Holyrood's all-male management group of MSPs quit, amid criticism about the lack of gender balance. They were replaced by Labour MSP Kezia Dugdale and SNP MSP Sandra White. Standards, Procedures and Public Appointments Committee Clare Haughey says: "A little over six months ago we entered into a new era." Ms Haughey says sexual harassment became front and centre of the political agenda and that included at Holyrood. She thanks Labour MSP Daniel Johnson for calling for an inquiry into sexual harassment at the parliament and for resigning from the committee to help gender balance. The SNP MSP also praises the SPCB for establishing a helpline for those experiencing sexual harassment. She says she was very disappointed a survey showed low confidence in the process of dealing with complaints. We have recommended that a central policy on sexual harassment be created for everyone. This should include a zero tolerance statement, she argues. A report into sexual harassment at the Scottish Parliament has called for policies and procedures to be "urgently addressed". It follows claims that a fifth of parliamentary staff - including one in three women -had experienced sexual harassment or sexist behaviour. Holyrood's standards committee said there was a lack of confidence in the way complaints were currently handled. It also recommended MSPs underwent training on harassment awareness. The inquiry was sparked by allegations of sexual misconduct at Holyrood, which emerged as part of the #MeToo movement following high-profile cases in Hollywood and Westminster. The Standards, Procedures and Public Appointments Committee will now lead a member's debate on its sexual harassment and inappropriate conduct inquiry. Lib Dem MSP Mike Rumbles asks for the minister's vision for the future of agricuture post-Brexit, without complaining about the UK government. Mr Ewing says he wants financial support for rural Scotland to be continued at the level promised by the Brexiteers. The minister calls for the "£160m siphoned of by UK Treasury" to be returned. The Scottish government has accused the Treasury of a "great rural robbery" of £160m in EU subsidies it says is owed to hill farmers north of the border. The two governments have been locked in a dispute over where extra Common Agricultural Policy funds should go. The Scottish Conservatives support the funding coming to Scotland, and Dumfries and Galloway MP Alister Jack has raised the matter with ministers.